When I see chocolate cookie recipe, I am always tempted to prepare it. But choco chips are not available at Madurai. I tried adding chopped chocolate compound, but I was not happy with the end result. So today I tried preparing the chips at home. With practice and patience, I got some tiny choco chips. I prepared the cookies immediately. They came out so nice. Tomorrow I will be posting the recipe for cookies. 1. Melt the compound in a double boiler. 2. Cut off one end of a plastic bag and insert a cake decorating nozzle with a round tip. 3. Pour the melted chocolate into the bag. 4. Line a tray with wax paper. Keep small dots with the melted chocolate. 5. Keep the tray in fridge for 5 minutes. 6. Carefully remove the chips. 7. Use it in any recipe which calls for choco-chips. Make small dots. Let it set. Great work Gayathri..chocolate chips looks soo cute..Happy New year wishes to u and ur family.. This looks quite easy, shall be very helpful. Happy 2011 to you! It is very identical to chocolate but it lacks the lustre of the chocolate. This can be used as an alternative to chocolate. Gayathri this is a welcome post— i have troubles finding choco chips too ! Thanks for sharing–it is bookmarked ! lovely.. so handy when u r short of chocolate chips.. happy 2011! wonderful idea.Wishing u and your family a happy New Year. Wow..never knew its easy to prepare at home though requires some patience.. Happy new year to you and your family Gayatri.. 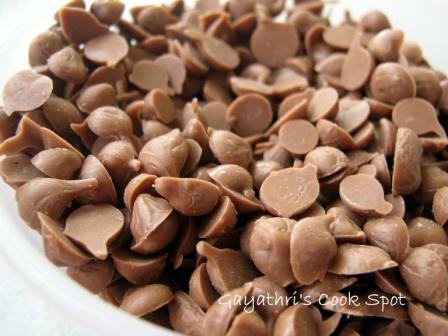 Very Nice Gayathri .Even I could not prepare many dishes as I could not get chocolate chips . Good one Gayathri … the chocochip looks cute. I think I have to contact u after I come to Madurai..cos everytime I used to get all these from here.. WIsh u HAppy New Year !!! Wow what an amazing idea! !I too do not get choco chips here.Will be trying these out soon,thanks for this awesome post..
wow !!! this is really a good one..Thanks for letting us know and ur patience obviously !!! wow this great Gayathri…..happy new year to u and fly. Homemade chocolate chips looks awesome. Happy new year to you and your family. Lovely idea of making the choc chips at home! Wishing you a Great year ahead, girl! My god your patience is amazing, mind blowing! I wish I had one iota of it. Wish you a very happy new year! you have lots of patience to make these at home….they r wonderful!! those are wonderful cute little chips….